The POWER LED indicates that +5VDC power is present on the board. The 8 Port LEDs marked 0 - 7 connect to port pins on the MCU. 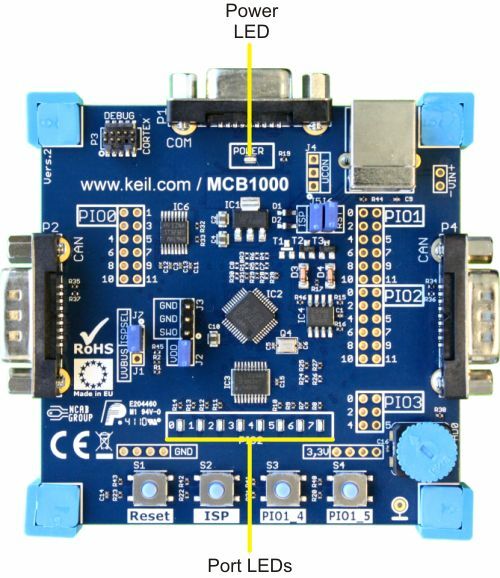 For the MCB11xx, MCB11Cxx and MCB13xx boards, the LEDs connect to PIO2.0 - PIO2.7. For the MCB11U10 board, the LEDs connect to PIO1.19 - PIO1.26. The Port LEDs are useful for indicating program status while testing your applications.